We are a manufacturer of Tensile Testing Machine for HDPE Bags and PP Bags which is used to determine Tensile and Breaking Strength of HDPE, PP, Jute and others flexible packaging. We are regularly supplying this Tensile Strength Tester to Sugar Industry, Cement Industry, Agricultural Products related Industry, Food MaterialIndustry.These machines can measure actual Breaking and TensileStrengthof any HDPE, PP and Jute Bags, None Woven Fabric Bags and other Flexible material. Our Tensile Strength Tester are used in HDPE and PP bag testing. 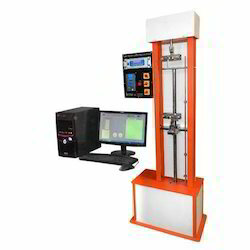 Tensile Strength Tester is based on constant rate of traverse principle in which one end of the test specimen is held in a stationary grip, while the other end is made to move at a known fixed speed with the help of motor, gear box and screw arrangement. 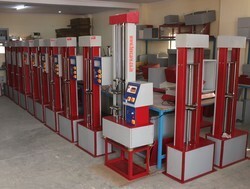 We are manufacturer of Tensile Testing Machine for HDPE Bags PP Bags.